July 25 wasn't a good day. Two reports came out within hours of each other. If you read either one of them, you might be a little worried. If you read both, you'd probably mourn the sanity of many Americans, but especially of those who run credit card companies. The first study, conducted by Princeton Survey Research Associates International (bet they didn't test that name in focus groups before they chose it), asked a sample of Americans how they managed their household finances. Just 58 percent said they tried in any way at all to track their spending against a budget. We're not talking here about writing down every cent that someone spends. No, the 42 percent with no budget don't even think to themselves: "My income is x. I need y to pay my rent/mortgage, utilities, taxes, credit card bills and other fixed expenses. I want to save n. That leaves me with a for everything else. And that has to last me until my next salary check arrives." Just who do these people think they are? The U.S. Congress? The second report (the one that might have sent you teetering over the edge into a bottomless chasm of hair-tearing incredulity) came from Equifax, one of the big-three credit bureaus that compile your credit report and credit score. One startling statistic stood out from the mass of data contained in its monthly report on consumer credit trends: the number of new credit cards issued to subprime borrowers was 80 percent higher in April 2011 than it was in April 2010. As a service to readers who daydreamed their way through that last line, or who assumed it was a misprint (and who could blame them? ), here it is again: the number of new credit cards issued to subprime borrowers was 80 percent higher in April 2011 than it was in April 2010. There is, surely, only one likely explanation for this. The satraps and Myrmidons who populate the middle management tiers of credit card companies have at last tired of watching, each Friday afternoon, their bosses sail off into the sunset in their mega-yachts, which, thanks to obscene Wall Street bonuses, are "loaded with a multitude of baubles … some of which may sometimes be of some little use, but all of which might at all times be very well spared, and of which the whole utility is certainly not worth the fatigue of bearing the burden." That quotation comes from Adam Smith's "The Theory of Moral Sentiments," a publication that for some reason figures somewhat lower on the reading lists of most financiers than the author's more famous "An Inquiry into the Nature and Causes of the Wealth of Nations." Anyway, back to the satraps and Myrmidons. Can you think of a more plausible explanation for credit card companies showering plastic on the uncreditworthy than that their middle managers, driven by envy of their bossess' ill-gotten gains, have finally decided--partly as a practical joke, and partly as an act of pure sabotage--to undermine their employers' business models? They're poor fools if that is the case. If there's a simple lesson that can be learned from the credit crunch, it's that, if there's one group who won't be disadvantaged when their get-rich-quick strategies turn to dust, it's the narcissists who take home seven- or eight-figure bonuses. The only other obvious explanation is madness. Albert Einstein is widely reported as having defined insanity as "doing the same thing over and over again, and expecting different results." You don't need to share his genius to see that that's precisely what credit card issuers are doing now. Just three or four years after burning their fingers through the creation of an enormous credit bubble that was largely inflated by subprime lending, the banks and their card and auto loan subsidiaries are again playing with fire. Credit card use can be a very good thing, both personally (see Seven reasons why credit cards are better than debit cards), and for the nation. Many economists believe that the current economic recovery will only really gain traction when consumers have the confidence to use their cards more. 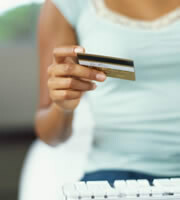 However, credit card debt that's out of control can ruin the lives of individuals and families. And, as everyone who isn't a decision-maker in a credit card business remembers all too well, it can do enormous damage to the wider economy. Subprime credit card debt may not have been as harmful during the credit crunch as subprime mortgage lending, but it sure didn't help. Some card issuers claim that they now have sophisticated new profiling systems that allow them to spot the respectable and responsible, who have through no fault of their own seen their credit scores fall into the subprime range, and differentiate them from the unendingly untrustworthy and uncreditworthy, who should never be let within a million miles of a line of credit. But if you believe that all of those who are currently approving credit card applications from subprime borrowers are being as thoughtful and careful as they should be, you're probably as crazy as the people who run credit card companies. 0 Responses to "Credit card companies take leave of their senses--again"